- Possibility of remote communication under ModBus Protocol. 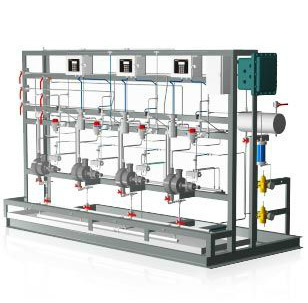 - Proportional to flow rate or process signals. - For one or several injection points. - Pneumatic or Electric driven pumps. 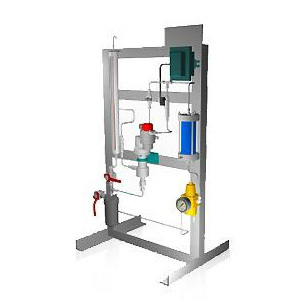 - Have many types of alarms for fails of the dosing pumps or low level of tank. - Feedback signal of pumps. - Accessories for calibration, measurement, injection. If is required counting with feedback signal to monitor the pump operation, Mirbla offer the so-called Injection sensor. 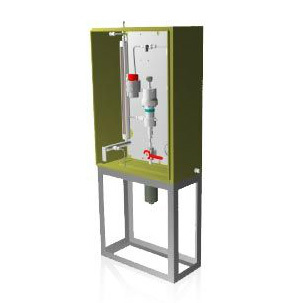 For the right dosification is essential perform a correct calibration of the dosing pumps, for this Mirbla Offer a different types of Calibration pots. 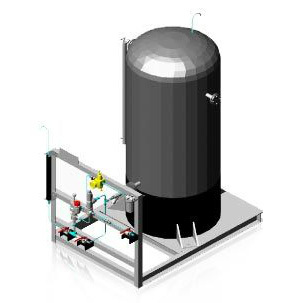 The different models count with distinct capacities and construction materials suitable for a huge variety of chemicals. It principal material is Pyrex graduated in Cubic centimeters and count with a mechanical protection to avoid the glass break by hits. - Controlling the pump by a process signal. - Give alarms for pump failures, process signal out of range, etc. - In Equipments with 2 or more pumps, commute between the titular pump and the standby pump. - Son aptos para áreas clasificadas. - Allow local settings or distance settings (Under ModBus protocol) and allow visualization of pump operation in the control room. It's very important perform a uniform dosification and homogeneous on the injection point, for this we develop distinct models of injection nozzle, these allow to the chemical product enter in the center of the pipeline. The injection is performed in spray form, ensuring the right mix in the process flow. It design allow it installation, or extraction during the service. Also allow perform additivations on line. Counting with connections to flanged process or screwed process, accord to the client specifications. These Nozzles have a retention valve to avoid venturi effect. - By it design allow the chemical product pass be in only one direction. - For the chemical product injection be as a spray form, generating a better mix between the chemical and the current of the process to treat. - In cases where it have depressions on the injection points. - When the chemical treatment is performed in a process which it fluid is a gas. We offer a huge variety of filters, where the client can find the right one for the application accord to the chemical composition. A) With our stroke regulator, this one have the particularity of it can change the movement of the piston or diaphragm of the pumps, linearly responding to a control signal, in this way keeps the injection frequency of the chemical product in the process independently of the flow of the pump. B) Varying frequency of the driving motor of the pump, for this can be included a proportional converter to signals of the process which can be configured manually. This type of regulation is used in process where the chemical injection not necessarily must be continuous, where the dosing frequency can be between 10 pulses per minute till 90 pulses per minute, without this affect the process. 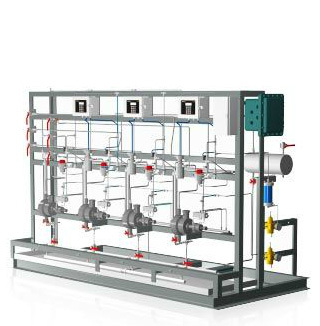 C) With our controllers of the FL series can adjust the function time of the pumps in proportional way to the process signal, keeping the flow rate in the Liters per hour which the client required. This type of regulation is used in process where the chemical injection can be interrupted in lapses of 30 seconds without this affect the process. - Stainless Steel AISI 316. The capacities can vary depending of the desired autonomy for the system. 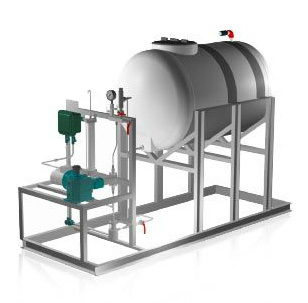 If is required, the tank can count with an agitation system or a recirculation system of the chemical product with the possibility of being automate for transfer. - Visual indicator type (needle which indicate the percentage). - Analog signal output level, transmitters of differential level, by radar, resistive type, etc. - Also can include alarm contact by lower level of tank which can be conducted to the control room or transmitted remotely. These contacts of tank level can be used also to stop the dosage equipment (in case of lack of product) or to activate the system of chemical product transfer. Sistema de dosificación, con una sola bomba de accionamiento eléctrico, con caja de mandos y motor a prueba de explosión. Monta un tanque de 1000 lts de capacidad. Sistema de dosificación, con una bomba de accionamiento neumático, de la serie ISM. Monta un tanque de 700 lts de capacidad en material PRFV. Sistemas de Inyección Química Múltiple, formados por 4 Bombas Dosificadoras del tipo Diafragma Hidráulico, con controladores de la serie FL, apto para áreas clasificadas. Sistema de Inyección Química simple con una bomba del tipo pistón buzo, serie ISM. Sistema de Inyección Química simple con una bomba del tipo pistón buzo, serie ISM. Montado dentro de un gabinete apto para intemperie.